The 2012 National Crime Victims’ Rights Week is taking place April 22nd-28th. This year’s theme is “Extending The Vision, Reaching Every Victim”. A 2011 statistic shows that every 2.8 minutes a woman is sexually assaulted. The Bartow County Victim Assistance Office will be highlighting this specific type of crime/victim next Wednesday, April 25th at 12:15. Several men (Elected Officials; Law Enforcement and District Attorney Staff) will walk around the circle in front of the courthouse in women’s shoes for approximately 3 minutes holding signs that say “Put Yourself in Her Shoes”. We are looking to borrow women’s shoes (any style)-size 11 & up! Your participation would be greatly appreciated as we work together to educate our community about crimes and their victims. Please respond to this email or give me a call at 678-721-3244 to let me know if you have any shoes we can borrow. Agan’s Bakery commemorates the “Great Locomotive Chase”. Co sponsors of the Kingston events are the Cartersville Bartow Convention and Visitor’s Bureau, Kingston Woman’s History Club, the Bartow History Museum and the Etowah Valley Historical Society. Historian and EVHS Vice President, Joe Head, conceived this idea and carried out the plans for it. granddaughter, Betty Johnson of Sarasota, Florida, and to Johnson’s daughter, Jena Johnson of Athens, Georgia. An additional copy will be given to the Kingston Woman’s History Club. The honorees will speak upon receipt of the proclamation. Trey Gaines, Director of the Bartow History Museum, will wear period clothing of the Depot Agent. Dignitaries, state representatives, officials are invited. Lunch will be at Angelo’s II and the public is invited. The honorees will be present. The Kingston Woman’s History Club will dedicate an engraved monument to Uriah Stephens placed behind the KWHC Museum. Stephens’ descendents will be present; will be honored at a tea in the Museum following the ceremony. The public is invited. Abbey Agan of Agan’s Bakery has designed a red iced teacake in the shape of the locomotive engine, The General. Any child who comes into the bakery during the next month, who gives a fact about the “The Great Locomotive Chase” will be given a free cookie. That child’s school will be given a point for that child’s participation. The school with the most points wins a package of bakery goodies for their favorite local charity. 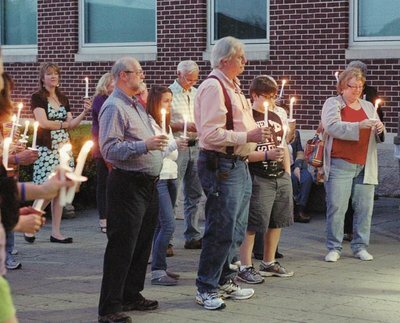 Advocates for Children members and visitors met on the steps of the Frank Moore Administration and Judicial Center Monday night, gathering for Advocate’s newest event, called a Light of Hope ceremony. Every candle lit was a way to recognize children in foster care and observe National Child Abuse Prevention Month. “We decided we needed to do more than plant pinwheels in the ground,” she continued, referencing the pinwheels planted at the NorthSide Bank in Adairsville. Bartow County Department of Family and Children’s Services Director Lynn Green, Bartow County Juvenile Court Judge Velma Tilley and Assistant District Attorney Rosemary Greene spoke to the crowd, and all emphasized the importance of preventing abuse and helping victims. On January 27th, United Way Worldwide President and CEO Brian Gallagher spoke at the World Economic Forum in Davos, Switzerland. The photo above was captured during the “Building Trust” session at the Forum’s 2012 Annual Meeting. Brian also participated in the “Leading Under Pressure” panel, discussing the importance of collaboration and the need for an active, engaged civil society. Brian is one of the Forum’s few Nonprofit/NGO sector leaders. Additional information on Brian’s sessions as well as the World Economic Forum can be found at http://www.weforum.org. To learn more about local United Way activities visit United Way of Bartow County.